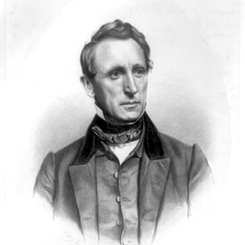 Image courtesy of Library of Congress An abolitionist, John Bingham of Ohio served eight non-consecutive terms in the House. A lawyer by trade, Bingham was named a special judge advocate in the trial of the conspirators against the life of President Abraham Lincoln. On this date, Radical Republicans under the direction of Thaddeus Stevens of Pennsylvania rammed a measure through the House that abolished the practice of slavery in the District of Columbia. Introduced in December 1861, the legislation fulfilled the wishes of Radical Republicans, the driving force in Congress during the 1860s, by providing immediate freedom to enslaved persons of the federally-controlled district. “Those born within the Republic, whether black or white, are citizens by birth—natural-born citizens,” Representative John Armor Bingham of Ohio declared. “There is no such word as white [sic] in your Constitution.” The bill came nearly a year to the day after the opening shots of the Civil War at Fort Sumter in Charleston, South Carolina. Bingham reminded colleagues of that anniversary—when “slavery opened its batteries of treason” by attacking Union forces at the fort. “Let the anniversary of that crime be signalized by the banishment of slavery forever from the national capital,” he implored colleagues. To ease the sting for slave masters, the measure provided compensation to owners loyal to the Union; however, during floor debate, Albert Gallatin Riddle of Ohio condemned slavery as “a hideous anachronism,” describing its abolition in the District of Columbia as a precursor to national emancipation. Without southern Representatives present to block the bill, it sailed to passage. Nearly every Republican and a group of Unionists and northern Democrats voted for the measure, which passed the House by a count of 92 to 38, and was enacted into law on April 16. The act preceded the Emancipation Proclamation—signed by President Abraham Lincoln on New Years Day 1863—freeing slaves in captured Confederate territories and the 13th Amendment, ratified in 1865, which abolished slavery everywhere in the United States.